After winning all of their games last week, the WSC baseball team's record is now 19-7. The Cats are now in possession of fourth place in the NSIC. 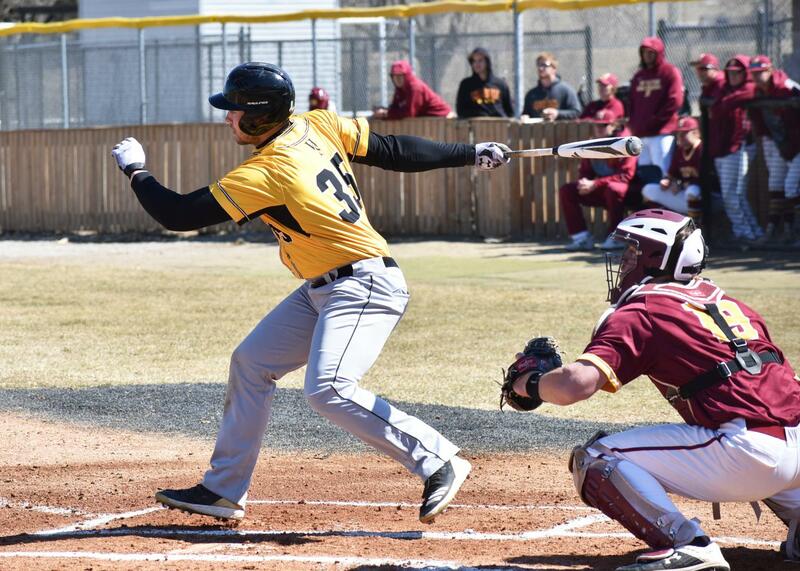 Wayne State baseball swept U-Mary in a doubleheader last Wednesday and Northern State in a three-game set this past Sunday and Monday to increase their win streak to 10 games and move into sole possession of fourth place in the NSIC. WSC is now 19-7 (10-3 NSIC) and holds the longest win streak in the conference. In Wednesday’s opener, the Marauders opened the scoring on an RBI double from Jaxon Kostka in the top of the second inning. In the following frame, sophomore Andrew Hanson hit a two-run homerun to left center, his third slam of the season, to even the score at a run apiece. 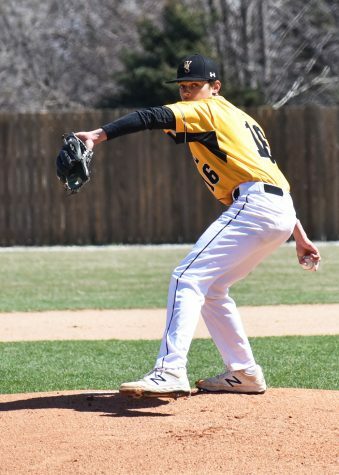 After freshman Ryan Obrecht worked around a jam on the mound in the top of the third, WSC scored three runs for a 4-1 advantage. Alex Logelin and Hanson recorded back-to-back base hits before Bryce Bisenius lifted his sixth homer of the year over the right field wall to give the ’Cats a three-run advantage. In the fourth, Peyton Barnes led off the frame with a single. Later in the inning, Brendan Madsen scored Barns on a sacrifice fly to give WSC a 5-1 lead. Obrecht surrendered another Marauder run in the top half of the fifth before being relieved by fellow freshman Andrew Staebell. Obrecht went five innings, allowing two runs on four hits in what would result in his third win of the season. After recording a one-two-three sixth inning, Staebell retired two U-Mary batters in the ninth but allowed three Marauders to reach base. Koch opted to bring in Charles Hasty, who struck out U-Mary’s Chris Scott to seal victory number six in a row for WSC. In the second game of Wednesday’s twin bill, the Wildcats got on the board in a similar way in which they did the first game. Travis Miller hit his second homerun of the year to give WSC a 1-0 lead. In the bottom of the third, it was Miller again finding the fences with a two-run shot to left to extend the Wildcat lead to three. The Marauders then scored two runs in the top of the fourth courtesy of a homerun and back-to-back doubles to cut its deficit to 3-2. Mary tied the game up at 3-3 in the fifth, but Barnes scored Hanson in the bottom half on an RBI double to retake the lead for WSC. The Wildcats extended the lead to 5-3 in the sixth when Madsen scored on a sac fly from Thompson. After each team failed to produce any runs in the seventh, Mary’s Darius Barlas hit a two-run shot to tie the game at 5-5 in the eighth. After the first two Wildcats were retired in the bottom of the eighth, Logelin stepped up to the plate and added to the barrage of homers. His solo shot retook the lead for WSC at 6-5 headed to the ninth. “When Logelin and Thompson are hitting, we’re all hitting,” Koch said. Hasty got the ’Cats within an out of another victory before the Marauders’ William Kranz hit an RBI single to tie the game at six runs apiece. 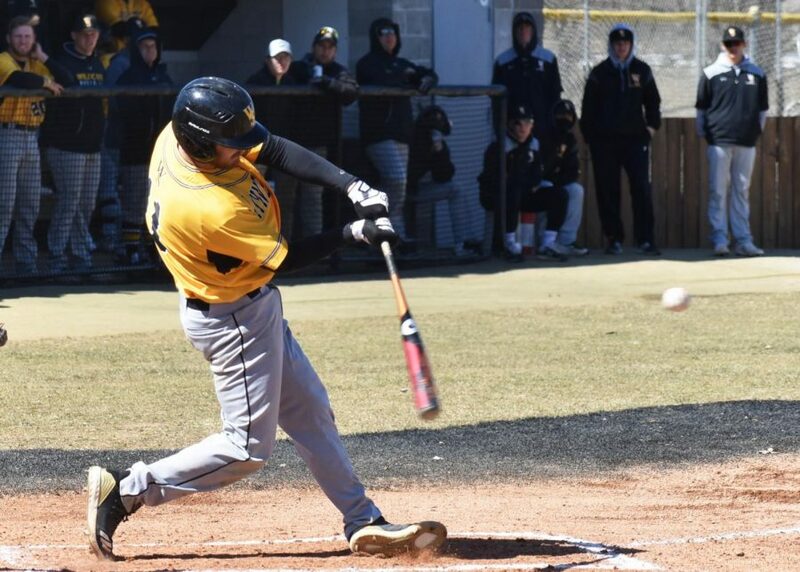 In the bottom of the ninth, Bisenius was hit by a pitch to bring the winning run aboard for Wayne State. Colin Chick pinch ran for Bisenius and advanced to third on a pair of wild pitches. 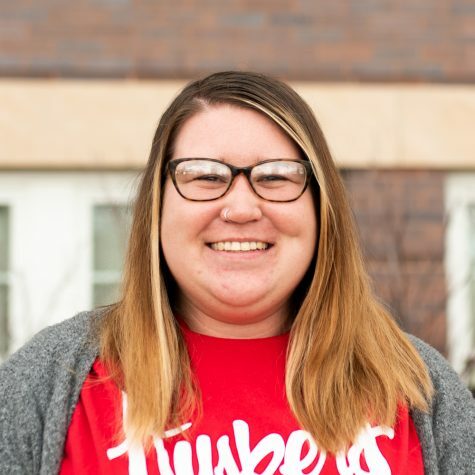 Mary opted to intentionally walk Hanson and Miller to create a potential force out at each base. Jake Lemar then slapped a base knock to left center to score Chick and give the Wildcats a walk off victory for their seventh win in a row and a 16-7 record. Cade Herrmann got the start for WSC, going five innings while allowing three runs and recording four strikeouts. Mitch Gullikson recorded a perfect inning of relief; Aaron Ras tossed two innings of two-run ball and Hasty picked up the win. “At the end of the day, we just find ways to win,” Miller said. 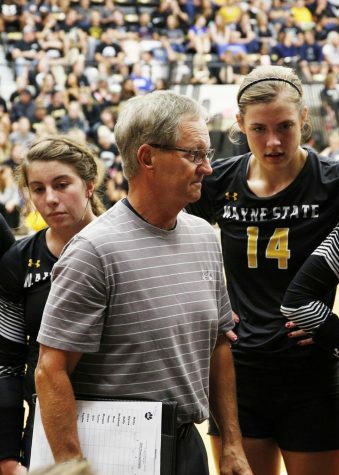 The Wildcats returned to action Sunday for a three-game set against Northern State, with the first two games on Sunday and the latter of the three on Monday. 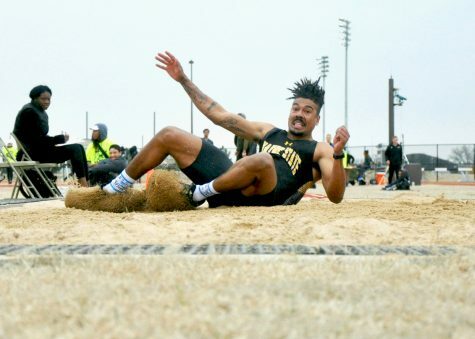 The games were initially scheduled to be played on the road for WSC, but poor field conditions in Aberdeen delayed the games a day and moved them to Wayne. The Wildcats were still officially the road team despite the location of the games. In Sunday’s opener, starting pitcher Aidan Breedlove earned his fifth win of the season after producing 4 2/3 innings of two-run ball, adding four strikeouts. Breedlove didn’t allow a run through the game’s first four innings, but Northern State tabbed the righty for two runs in the top of the fifth. Staebell relieved Breedlove with two outs in the fifth and tossed 2 1/3 innings of scoreless ball to earn his first save of the season. 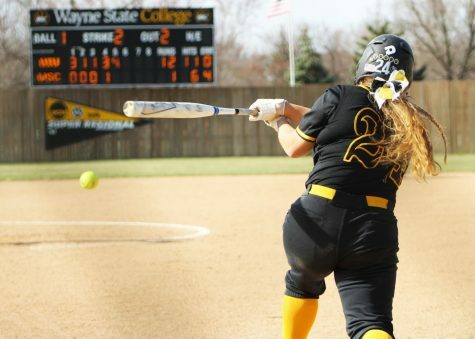 Offensively, all of WSC’s scoring occurred in the second inning. Hanson led off the inning with a solo homer to left to give the ’Cats a 1-0 lead. After one-out singles from Peyton Barnes and Lemar, CJ Neumann roped a double down the left field line to score Barnes and bring Lemar to third to make it 2-0. The next at-bat, Madsen reached on a throwing error that allowed Lemar to score and Neumann to advance to third to make it 3-0 in favor of WSC. Neumann then scored to make it 4-0 on a Thompson RBI single. After Madsen found his way to third on a steal and Thompson’s single, he scored on a wild pitch to bring the score to 5-0 Wayne. The 5-2 final improved WSC’s record to 17-7 and 8-3 in NSIC play. In the second game of Sunday’s twin bill, an abundance of runs is what allowed the Wildcats to win their ninth game in a row. 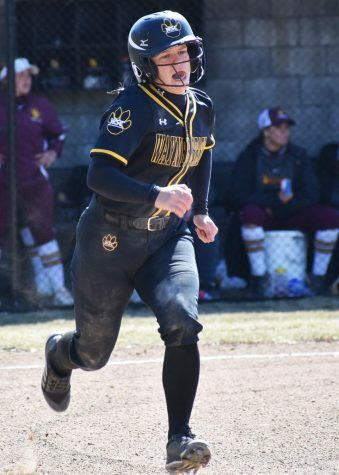 WSC’s first run came in the opening inning, when Logelin, who was hit by a pitch with one out, scored on an RBI single from Bisenius to make it 1-0. In the top of the third, Madsen led off the inning with a single up the middle. After Logelin lined out, Thompson smacked a two-run homer to left to extend WSC’s lead to 3-0. After the Wolves scored a run in the bottom of the fourth, the Wildcats responded with three of their own in the fifth. Thompson picked up his third RBI of the day on a double to left which scored Logelin to increase the Wildcat lead to 4-1. Bisenius followed with an RBI single to score Thompson, who scored easily on an RBI triple from Hanson to give WSC a five-run advantage. In the sixth, Bisenius scored Madsen and Logelin on a double to left center to give Wayne State an 8-1 lead. Miller drilled a solo shot to left to provide the Wildcats with even more breathing room. Northern tallied two runs in the bottom half of the seventh to cut its deficit to six runs, but WSC again had an answer, this time courtesy of four runs in the eighth. After Madsen was walked and Logelin was hit by a pitch to start the inning, both scored on a failed pickoff attempt and a wild throw to give WSC an 11-3 advantage. Later in the inning, after Thompson was hit by a pitch, Brandon Barker hit for Hanson and delivered with a two-run homerun over the center field wall to make it 13-3 in favor of the Wildcats. The four-run eighth inning for WSC proved valuable, as the Wolves put together five runs on five hits to cut the Wildcat lead to 13-8. Wayne State scored one more run in the ninth when Neumann scored on a sac fly from Thompson that brought the Wildcat lead to six runs. Northern State did no further damage, as Hasty delivered a scoreless ninth to cap win number 18 on the year for the Wildcats. On Monday, WSC relied on solid pitching and defense, a common theme this season, to earn a 3-2 win and a sweep of the Wolves. Lawson Zenner was given the nod on the mound for the ’Cats, who entered the day in search of their 10th consecutive victory. Zenner threw 59 pitches over five innings, allowing just one run on two hits. 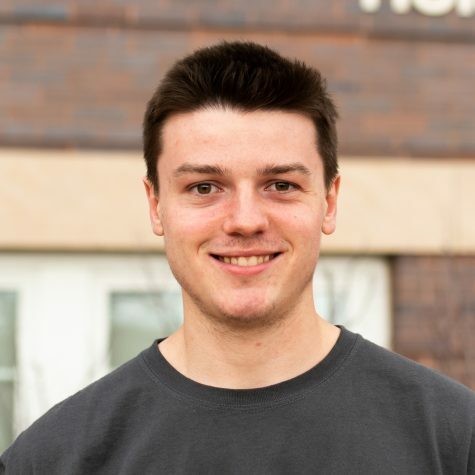 Wayne State was held scoreless until the sixth inning, when Madsen singled, made his way to third on a steal and throwing error and scored on a throwing error from Northern State catcher Spencer Sarringar. Logelin, who stole second on the play, also scored on the errant throw from Sarringar to give WSC a 2-1 lead. In the seventh, Miller reached base on a single to left field. The next at bat, Barnes also singled to left. Barnes’ base knock got past Wolves left fielder Chad Hinkle and allowed Miller to score and Barnes to reach second base and bring the Wildcat lead to 3-1 for a vital insurance run. Northern’s Spenser Larson hit a homerun to left center in the bottom of the seventh to again make it a one-run ballgame. 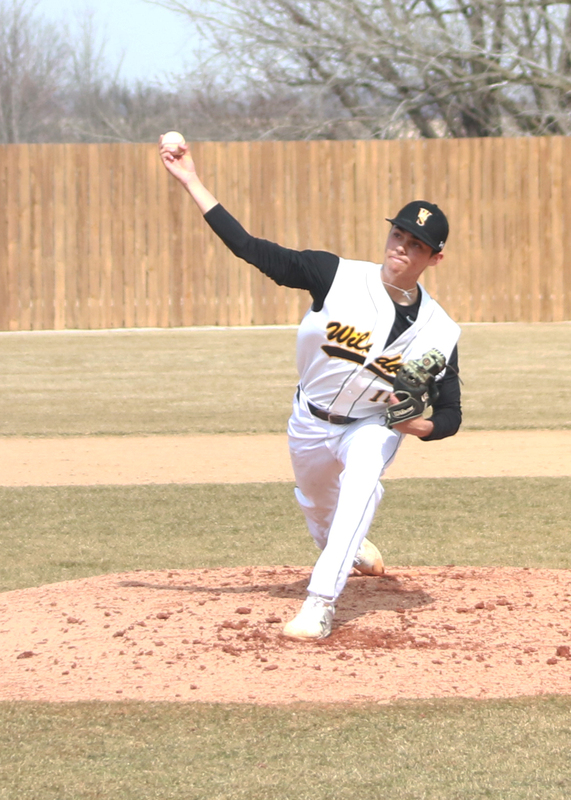 Herrmann and Hasty delivered two innings of scoreless work on the mound for Wayne State in the eighth and ninth innings to secure a 3-2 win and a 10th consecutive victory. The Wildcats are on the road today for a doubleheader against St. Cloud State, who is currently ranked number four in the nation. The first game is scheduled for 1 p.m. and the second to follow at approximately 4 p.m. WSC is on the road this weekend as well for a three-game series against Southwest Minnesota State beginning with a 12 p.m. first pitch on Saturday.